Posted October 30, 2013 by Will (Chief Information Officer) . Google+ has rolled out yet another update this week in an effort to keep up their status as one of the top social networks in the world. 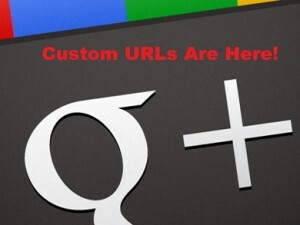 It’s been rumored since August of 2012 that Google+ has been working on making custom URLs available, but until now, this feature had not been offered to the masses. As of this week, Google has finally announced that it will be expanding the availability of custom URLs to both individual and business profiles. A custom URL (aka vanity URL) is a unique web address or domain name that is created and branded for marketing purposes. Up to this point, we have seen vanity URLs used most commonly on Facebook and Twitter. For example, the current Google+ URL for Automated Marketing Group is https://plus.google.com/104471985150377247993/.With a custom URL, we could change that web address and make it easier to share by choosing something more branded such as google.com/+AutomatedMkt. How do I know if my profile can be updated? Google has already started to notify current users that their profiles are eligible for the update. If you haven’t seen an email in your inbox yet, don’t panic. Google has stated that they will be continuing to roll out the update to users over the next week. In order to be eligible for the custom URL feature, your profile does have to meet the criteria below. Do I need a custom URL for my business? YES. Custom URLs allow users to claim their business name and increase their branding online by making their profile unique and easier to remember for their customers, employees, potential and current followers, and most importantly, Google. The only drawback with this update for businesses is that Google preselects the URLs that you can choose from. They may give more than one option or a chance to add a few numbers or letters to make the URL more unique, but you will not be able to manually input a URL. If you are not sure if your profile is eligible for the update or you need help getting your business started on Google+, contact us. Our team of social media experts will make sure that your business is ready for success on Google+!